As you know, I'm a big fan of Vibram FiveFingers, but have I told you how much I also love my Terra Plana Vivo Barefoot shoes? I bought my first pair of Vivos (black Dharmas) a few months ago -- mostly because I was getting a few too many weird looks from co-workers when I wore my FiveFingers to the office -- and my feet (and knees and shins) have never felt better. The soles are thinner in the heel than even FiveFingers, and the toe box is flat and wide enough for me to spread and flex my toes with room to spare. It's the next best thing to going barefoot at work, and when I trek around town, I can feel my arch and calf strength continuing to build. 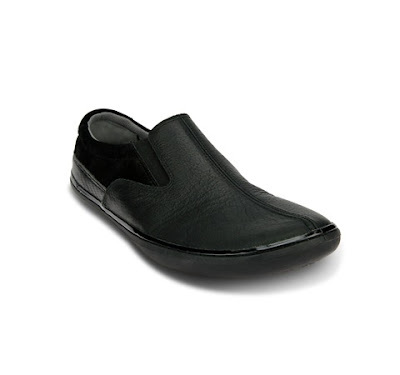 The shoes are pliable and soft, with no break-in time required. The slip-on Dharmas are also awesome for air travel -- they're off and on again in a flash at the security gate, and they're comfortable on the plane. It feels like you're wearing slippers all the time. The drawback, though, is that you also look like you're wearing slippers all the time. The super-wide front of the shoe isn't the most attractive thing in the world -- but for me, the pros outweigh the cons. If you're interested, here's a detailed review of Vivo Barefoot shoes. And if you're thinking about buying a pair, remember to: (1) buy a size bigger than you normally wear (they run small), and (2) look for a coupon code online. The other day, I pulled on my (barely used) cross-trainers just to take out the trash; I felt like I was balancing on stilts, and my feet were encased in foam. These days, the only shoes I wear are Vivos, Vibrams, and very occasionally, my well-loved Chuck Taylors -- shoes with little to no support or sole. I work out with Vibrams or barefoot, even when jumping around like crazy. And yet my knee troubles and shin splints are gone.